In order to study the contribution of vehicular emissions to urban environmental pollution, measurements of magnetic susceptibility and elemental analysis was conducted on soil samples collected from roundabouts and roadside gutters in Jalingo Metropolis, Taraba State. Magnetic susceptibility was performed on a total of 61 samples using Bartington MS2B Susceptibility meter while elemental analysis was done on selected samples using Atomic Absorption Spectrophotometer (BUCK 210 Model). Results obtained show magnetic susceptibility enhancement which ranged from 106.3 to 475.1 × 10-8 m3kg-1 and 42.8 to 289 × 10-8 m3kg-1 in the roundabouts and gutters samples respectively which implies increase in ferrimagnetic minerals in the samples. The frequency dependence of magnetic susceptibility indicates the dominance of non-super paramagnetic fraction resulting from anthropogenic sources. The concentrations of Fe, Pb, Cu, Zn and Mn on selected samples show comparable values in both gutter and roundabout samples. Their mean values in mg/kg for gutter and roundabout samples respectively are 21. 80 and 21.94 for Fe; 0.01 and 0.02 for Pb; 1.74 and 0.98 for Cu; 1.75 and 1.86 for Zn and 4.22 and 4.71 for Mn. Correlation analysis between magnetic susceptibility and heavy metals shows that magnetic susceptibility can be used as a proxy for assessing Pb, Cu and Zn pollution in the gutter samples but no correlation was obtained between both parameter in the roundabout samples. Organic matter content did not show any effect on magnetic susceptibility in all samples but might affect the concentration of some heavy metals. Industrialization and urbanization have their advantages and disadvantages to the urban environment. One of the major demerits is the pollution of land, air and water. The level of pollution is most often assessed and monitored using chemical and geochemical methods [1,2]. This approach requires expertise, wastes a lot of time and finance and therefore cannot meet the ever increasing demand on pollution data. The use of magnetic methods which is non destructive, cost and time effective can be used as a faster means of assessing pollution hotspots in soil/sediments [3,4]. Measurement of magnetic properties and in particular magnetic susceptibility is used to indicate the concentration of metal pollution. Increase in the magnetic susceptibility of top soils and sediments resulting from the input of industrial and vehicular magnetic particles and their relationship with some heavy metals have been described by many authors [5-7]. The use of magnetic susceptibility for heavy metal pollution assessment is based on the co-existence and similar sources of heavy metals and anthropogenic magnetic particles. Usually, the heavy metals are incorporated into the lattice structure or are absorbed on the surface of iron oxides [2,8]. A major contribution of anthropogenic magnetic particles is from vehicular sources which include emissions from vehicle exhausts, wear and tear of automobile parts, corrosion of vehicle parts, brake lining etc. Studies on the anthro pogenic magnetic particles from vehicular emissions and their correlations with heavy metals revealed that magnetic parameters can serve as potential heavy metal pollution proxies [9-12]. (2) Compare the results obtained from both study sites (roundabouts and roadside gutters) and hence establish which is a better carrier of magnetic signal from vehicular sources. Jalingo, the study area is the capital city of Taraba State which is located between latitude 6030’ and 8030’ North and between 9000’ and 12000’ East (Figure 1). According to the 2006 census figures released by the National Population Commission, Nigeria, Jalingo has a total population of 118,000 inhabitants. Jalingo is a city with no major industry. The major pollution sources are from vehicular sources, alternating current generators, and indiscriminate refuse dumps. The detailed geology of the study area can be found in our earlier paper  (Figure 1). 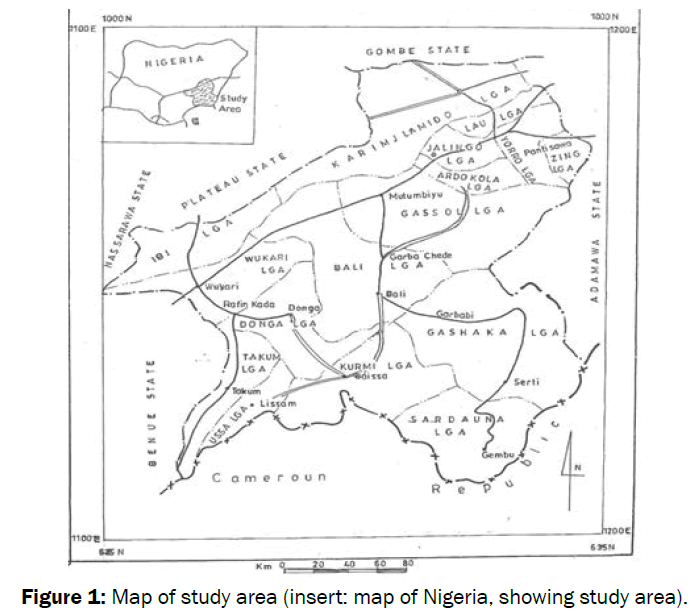 Figure 1: Map of study area (insert: map of Nigeria, showing study area). A total of 61 topsoil/dusts samples were collected randomly from three major roundabouts, namely road block roundabout (RBRA), Patanya roundabout (PRA) and Forest roundabout (FRA) and three township roadside gutters, namely, Hammaruwa way gutter (HWG), palace way gutter (PWG) and Umaru sale street gutter (USSG). The samples were packaged in a plastic bag and transported to the laboratory. In the laboratory, the samples were air dried for some days to reduce mass contribution of water and to avoid any chemical reactions. They were then gently disaggregated using agate mortar and a pestle, sieved using a 1 mm sieve mesh  and stored in plastic containers. The mass specific magnetic susceptibility measurements were carried out on the sieved samples packaged in a 10 ml plastic container at laboratory temperature. Measurements of magnetic susceptibility were made at both low (0.465 kHz) and high (4.65 kHz) frequencies using MS2B dual frequency susceptibility meter linked to a computer operated using a Multisus2 software. All measurements were conducted at the 1.0 sensitivity setting. Each sample was measured three times with an air reading before and after each series for drift correction. Where and are the low and high frequencies susceptibility respectively. Eleven roundabout and eight gutter samples were selected based on their magnetic susceptibility values for heavy metal analysis. 2 g of samples was mixed with 20 ml of conc. HNO3 and allowed to stand for one hour. HClO4 was added and hot plate digestion was carried at about 200-220°C. The digest was dissolved in 0.1M HCl, filtered and made up to 50 ml by adding distilled water. Heavy metal concentrations (Fe, Pb, Cu, Zn and Mn) were determined using atomic absorption spectrophotometer (BUCK 210 model). Organic matter content was determined by loss-on-ignition method following . The mass specific low frequency magnetic susceptibility (χlf) values measured in both roundabout and gutter samples show enhancement in magnetic susceptibility with the roundabout samples showing the highest enhancement. The χlf enhancement indicates the predominance of secondary ferrimagnetic minerals in the samples. The higher χlf values in the roundabouts might be as a result of accumulation of pollutants released during braking and acceleration since vehicles slows down (applies break) when approaching or negotiating a roundabout. According to Mathissen et al  in Bućko , both acceleration and braking enhance particle concentration, but braking causes higher emissions than acceleration. Similar observations were also made by Marie et al  around a tollbooth area in Argentina. In the roundabout samples, the mean values are 250.15 ± 48.73 x 10-8 m3kg-1, 230.44 ± 140.03 x 10-8 m3kg-1 and 321.34 ± 108.29 x 10-8 m3kg-1 for the RBRA, PRA and FRA respectively (Table 1). These mean values suggest that magnetic particles are more abundant in the FRA compared to RBRA and PRA. The mean χlf values of the gutter samples are 130.69 ± 61.43 x 10-8 m3kg-1, 132.07 ± 74.04 x 10-8 m3kg-1 and 126.40 ± 74.04 x 10-8 m3kg-1 for PWG, HWG and USSG respectively (Table 2). The gutter samples displayed comparable magnetic susceptibility values. The measurement of frequency dependent magnetic susceptibility (χfd%) is used to detect the presence of ultrafine ferrimagnetic [also called super paramagnetic (SP) fraction less than 0.03μm] magnetic grains [17-19]. When SP minerals are present in soil samples, the magnetic susceptibility values at high frequency are slightly lower than the magnetic susceptibility at low frequency. If there are no SP minerals, the two measurements are identical  and coarse multi-domain (MD) magnetic grains are present. The results of χfd% are shown in Tables 1 and 2 respectively for the roundabouts and gutter samples. The mean values of χfd% are 1.09 ± 0.99% for RBRA, 0.77 ± 0.67 % for PRA and 0.55 ± 0.36% for FRA (Table 1). The results indicates that samples for these roundabouts are dominated by coarse non SP multidomain and stable single domain (SSD) magnetic grain sizes from pollution sources. Compared to fine SP particles usually of pedogenic origin, the coarser particles such as MD and SSD are frequency independent [7,17]. According to Dearing , χfd% ≤ 2% indicates a negligible proportion of ultrafine pedogenic ferrimagnetic minerals while χfd% between 2 and 10% indicates a mixture of SP and MD/SSD grains. The mean values of χfd% of the gutter samples also show the dominance of MD and SSD grins with values of 1.81 ± 0.72% for PWG, 2.09 ± 1.97% for the HWG and 2.48 ± 1.06% for the USSG (Table 2). Generally, MD and SSD particles originate from anthropogenic sources . In this case, it could be originating mostly from vehicular sources. Table 1: Magnetic parameters measured for Roadblock (RBRA), Patanya (PRA) and Forest. A negative trend was obtained in the plot of χfd% against χlf shown in Figures 2 for the roundabouts and gutter data. Such negative trend indicates that the magnetic susceptibility signal originate from industrial/anthropogenic sources . 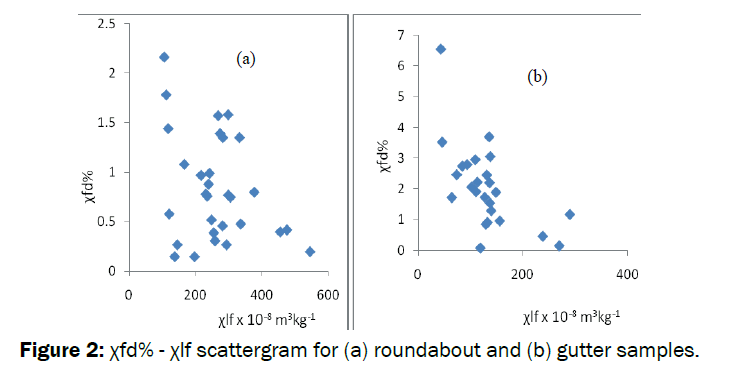 Figure 2: χfd% - χlf scattergram for (a) roundabout and (b) gutter samples. Table 3: Heavy metal concentrations and Organic Matter content (OM) for Roundabout samples. Table 4: Heavy metal concentrations and Organic Matter content (OM) for gutter samples. To investigate the relationship between magnetic susceptibility and heavy metal contents, a correlation table was established using Microsoft Excel 2007 (Tables 5 and 6). In the roundabout samples, poor and negative correlations were obtained between χlf and Fe, Pb and Mn concentrations. Cu and Zn show weak and positive correlation with χlf (Table 5). This result indicates that magnetic susceptibility may not be a good measure of heavy metal contamination in the roundabout samples. Similar result was obtained by Carraz et al  in road deposited sediment from Greater Manchester, UK. According to Carraz et al , the non correlation between χlf and heavy metals is because the metals and mineral magnetic components are derived from different sources or there are more than one contamination sources. Another possible cause of non correlation could be attributed to the coarse grained nature of the magnetic particles of the samples. Adsorption of heavy metals is greater on finer particles . Table 5: Correlation matrix between χlf and heavy metals for roundabout samples. Table 6: Correlation matrix between χlf and heavy metals for gutter samples. In the gutter samples, χlf is strongly positively correlated with the concentration of Cu and Zn, implying that magnetic susceptibility could be used as proxy for these metals concentration. Pb is moderately correlated with χlf while Fe and Mn are negatively correlated with χlf (Table 6). Correlation analysis between heavy metals in the gutter samples revealed strong positive correlation between Fe and Mn, Pb and Cu, Pb and Zn, and Cu and Zn (Table 6). This implied similar sources of contamination. Zn has been suggested to be derived from tyre wear, Cu has been traced to vehicle activity from corroded car body work . Fe and Mn have been suggested to be derived from a number of sources including geogenic background sources . High organic matter (OM) content was obtained in both roundabout and gutters samples. The mean values are 80.36 ± 2.66% and 81.63 ± 3.93% in the roundabout and gutter samples respectively (Tables 3 and 4). Organic matter has a diamagnetic character and is expected to decrease magnetic susceptibility . In this study, negative and poor correlation was found between OM and χlf in both roundabout and gutter samples (Tables 5 and 6). Correlation analysis between heavy metals and OM indicates that in the roundabout samples all the metals are positively correlated with OM with Fe, Pb and Mn displaying the highest correlation (Table 5). Whereas, all the metals except Pb are negatively correlated with OM in the gutter samples (Table 6). 1. The roundabout samples and gutter samples show magnetic susceptibility enhancement which indicates the presence of secondary ferrimagnetic minerals. 2. Frequency dependent susceptibility results indicates the dominance of coarse grained multidomain and stable single domain grain sizes which implied that samples contained pollution particles from anthropogenic loadings. 3. The heavy metal concentrations in all samples were within permissible limits set by USEPA and WHO. 4. Strong positive correlation between magnetic susceptibility and concentration of Cu, Zn and Pb in the gutter samples indicates that magnetic susceptibility could be used as a faster means of assessing these metals. Lack of correlation between magnetic susceptibility and heavy metal could results from variable sources of contamination and grain sizes. 5. Organic matter content is negatively correlated with magnetic susceptibility but displayed variable correlation with heavy metals. Petrovsky E. et. al. Magnetic properties of alluvial soils contaminated with Lead, Zinc and Cadmium. J. Appl. Geophys, 2001; 48: 127-136. Salehi MH. Relationship between magnetic susceptibility and heavy metals concentration in polluted soils of Lenjanat Region, Isfahan. E3sWeb of Conferences, 2013. Strzyszcz ZT. et. al. The influence of industrial imisiions on the magnetic susceptibility of soils in Upper Silesia. Stud. Geoph. Geod., 1996; 40: 276-286. Wang X. Heavy metals in urban soils of Xuzhou, China: Spatial distribution and correlation to specific magnetic susceptibility. International Journal of Geosciences, 2013; 4: 309-316. Robertson DJ. Geochemical and mineral magnetic characterization of urban sediments particulates, Manchester, UK. Applied Geochemistry, 2003; 18: 269-282. Carraz F. et al. Contaminated urban road deposited sediment (RDS), Greater Manchester, UK: a spatial assessment of potential surface water impacts. North West Geography, 2006; 6: 10-19. Dlouha S. et al. Investigation of polluted alluvial soils by magnetic susceptibility methods: a case study of the Litavka River. Soil and Water Res, 2013; 8: 151-157. Hoffmann P. Speciation of iron in the atmospheric aerosl samples. Journal of Aerosol Science, 1996; 27: 325-337. Gautam P. et al. Magnetic Susceptibility of Dust Loaded Leaves as a Proxy of Traffic -Related Heavy Metal Pollution in Kathmandu, Nepal. Phy. Chem. Earth, 2005; 29: 2201 -2211. Marie DC. et. al. Vehicle-derived emissions and pollution on the road Autovia 2 investigated by rock magnetic parameters: A case study from Argentina. StuiaGeophysicaetGeodaetica, 2010; 54: 135-152. El-Baghdadi M et al. Heavy metal pollution and soil magnetic susceptibility in urban soil of BeniMellal City (Morocco). Environ. Earth Sci. 2011. Crosby CJ. Application of mineral magnetic measurements as a pollution proxy for urban road deposited sediment. PhD Thesis, University of Wolverhampton. 2009; 353. Kanu, MO. et. al Measurement of magnetic susceptibility of soils in Jalingo, N-E, Nigeria: A case study of the Jalingo Mechanic Village. World Applied Sciences Journal, 2013; 24: 178-187. Zhang C. et. al. Assessment of heavy metal pollution from Fe- smelting plant in urban river sediments using environmental magnetic and geochemical methods. Environ. Poll, 2011; 159: 3057-3070. Mathissen M. et. al. Non-exhaust PM Emission measurements of a light duty vehicle with a mobile trailer. Atmospheric Environment, 2012; 59: 232-242. Bućko MS. Application of Magnetic, Geochemical and Micro- Morphological Methods in Environmental Studies of Urban Pollution Generated by Road Traffic, Univeristy of Helsinki. 2012. Dearing JA et al. Frequency Dependent Susceptibility Measurements of Environmental Materials. Geophys. J. Int., 1996; 124: 228-240. Venkatachalapathy R. et. al. The use of mineral magnetic parameters to characterize Archaeological artifacts. Lithuanian Journal of Physics, 2009; 49: 479 – 485. Sangode SJ. et. al. Magnetic Susceptibility Distribution in the Soils of Pune Metropolitan Region: Implications to Soil Magnetometry of Anthropogenic Loading. Current Science, 2010; 98: 516-527. Dearing JA. Environmental Magnetic Susceptibility, Using thrBartington MS2 System. England, Chi Publishing. 1999. Lu SG. et. al. Magnetic Particles as Indicators of Heavy Metals Pollution in Urban Soils: A case Study from the City of Luoyang, China. Geophys. Journ. Inter. 2007; 171: 603- 612. Hopke PK. et al. MultielementalCharacteraterization of Urban Roadway Dust. Env. Sci. Technol. 1980; 14: 164-172. Owliaie HR. The magnetic susceptibility of soils in Kohgilouye, Iran.Can. J. Soil. Sci., 2006; 86: 97-107.